Besides, a couple of days into our trip and following an unimaginable indulgence of sea creatures in their Cafreal, Xacuti, and Recheado avatars, I was more than just willing to renege on a self-imposed traditional-food-only canon. In addition, an accompanying vegetarian friend needed desperate rescuing from an over-dose of Au Gratin (once, Paneer Butter Masala even) masquerading as a local delicacy. As it turned out, neither one of us could have hoped for a better palate-cleanser than the eponymous condiment and its innovative use at this dual-cuisine cafe. Our attention that night was completely taken by the Bengali section of a menu that also hosts French fare. It’s a culinary marriage most interesting, convincingly held together by a long list of delectable wows. Mostly mild, some sweet, and a few unexpected scorchers! You should know though that not all dishes here are mustard-flavoured so there’s no danger of excess. For that, turn to their well-stocked bar. I found whisky a good pairing for most of what we ordered as starters: spiced Beetroot Chops, Ghugni (yellow peas curry) with Dalpuri (lentil-stuffed bread), BBQ on Fritters. 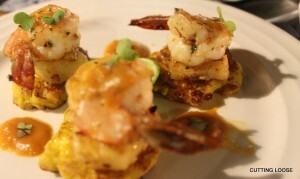 The fritters were a fantastic burst of taste and texture with pineapple cubes sandwiched between tiny corn pancakes and barbecued prawns with a tangy relish. The Mochar Ghonto (steamed banana blossoms) my friend ordered as a main came plated with rice, dal, a mustard-drizzled salad side, and sweet pineapple relish. It was quite superb I have to say, even if mellow in flavour. As was the Shorsher Ullash (mildly spiced pork cubes tossed in grainy mustard sauce) I was fast demolishing. Dessert was a toss-up between Mishti Doi, Malpuas or a more spirited food-chaser. I chose the latter. I returned for lunch a couple of days later, only to ensure that sense of content and well-being I doggy-bagged the other night was not a consequence of generous libations. It wasn’t. The piquant punch their Tentul Joler Sherbet (tamarind, mint, honey on ice) packed kept me sober right through the Chicken Blanquette a la Moutarde. The homey stewed chicken with rice was as close to comfort food as the India-seared French group on an adjoining table could possibly have wanted. Their sighs of contentment were as telling as my greedy shovelling. 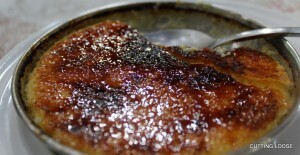 Then along came the Creme Brulee; first bite later I thought I’d died and gone to foodie heaven. After crunching through a perfectly torched caramel crust to get to that creamy, perfectly sweetened custard heart. Enough said. 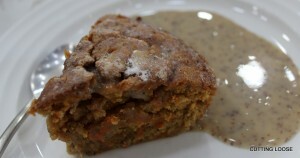 Another sweet-treat on the menu is what at first glance appears to be a most unlikely match–Brownie or Carrot Cake with sweetened mustard sauce. You’re in for such a surprise, trust me. Complete the indelible experience by washing it all down with a freshly brewed cuppa in the delightfully green backyard where, come Wednesdays, a rather dishy Krishna Vamsee also sings. 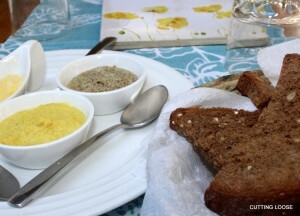 In short, when in Goa, you must Mustard. Darn! Missed it on this trip. “Must” catch it next time. 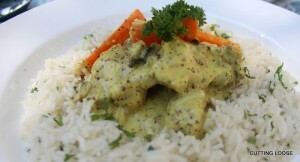 Sweetened mustard sauce. Wow! Planning a trip to Goa definitely. Once again thanks for the amazing tips. Wish I’d read all this last year, was in Goa for Diwali, couldn’t find good fare any place ! Reasons to Goa sometime soon keep growing…this is a dishy one, the food I mean. Hehhe, not really. The wood fire oven at Saraya nearby was my everyday favourite!